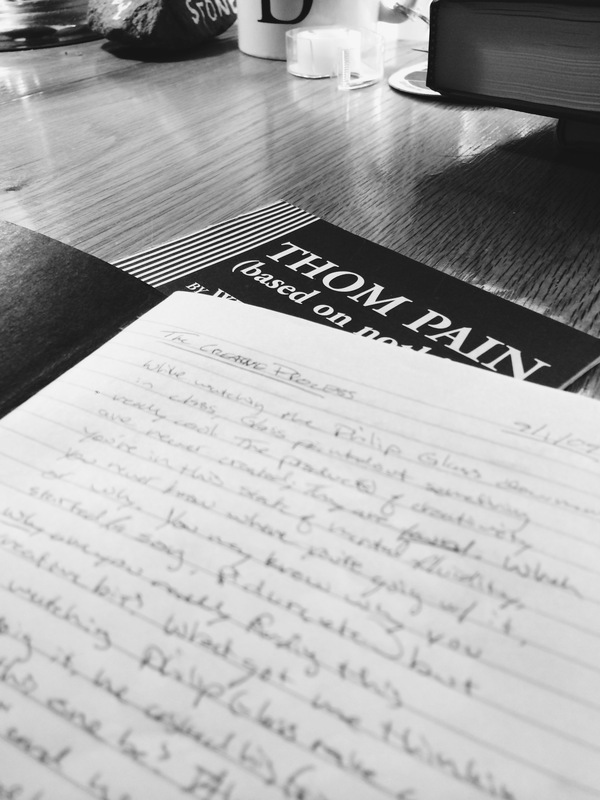 The following is the opening page from my “director’s notebook” I carried with me when I directed “THOM PAIN (based on nothing)” while a senior at the College of Charleston – both for the student theatre group in 2009 and a few months later after graduation for the 2010 Piccolo Spoleto Festival. I forgot I had written this until I found my notebook today. While watching the Philip Glass documentary in class [Glass – A Portrait of Philip Glass in Twelve Parts], Glass pointed out something really cool. The products of creativity are never created; they are found. When you’re in this state of mental fluideity, you never know where you’re going with it, or why. You may know why you started (a song, picture, etc. ), but why are you really finding this creative bit? What got me thinking was watching Philip Glass make a pizza. While doing it, he asked his friend, “What should this one be? Ahh…well let’s throw…” and he just threw some sauce on it and began adding toppings. He had no clue what to create, but he just started. That’s the creative process at its core – driving blindly down some road, making turns, hoping it brings you right back where you started, but you’re changed. I equate it to grocery shopping on an empty stomach. You know what you want – food. But what kind? When you’re in need for food, you buy things on impulse and, because of a certain feeling, you throw all these things into the basket (or a canvas, paper, stage) that you know you’ll use, but there’s no, seemingly, real reason you buy them. But at the end, it works.